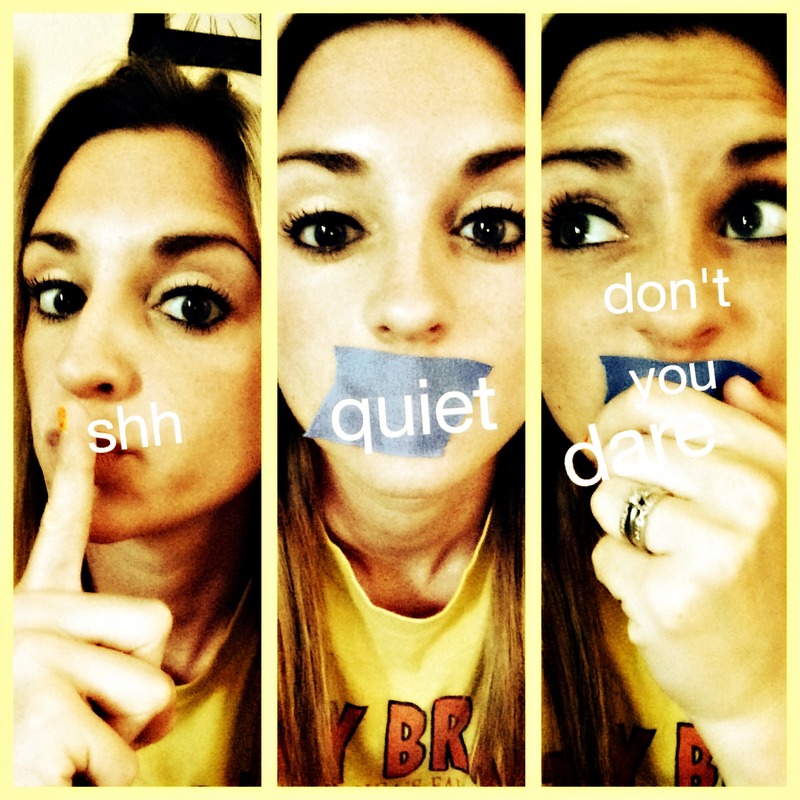 Let me first say, there were ample amounts of moments where I literally had to force my hands over my mouth to keep quiet! I witnessed a little anxiety along with slight anger rising up in me yesterday as I completed tasks on my to do list with four children. So what did my day look like exactly? Let me explain! 7:10am I woke up to a text message from my dear Step Son. He didn’t make it to practice this morning and had requested a ride to the gym at 6:50am. I did not receive this message because I was off in dream land. When I hurried to get ready to take him, he decided it was too late and didn’t want to go. I also woke up with this huge painful bump on my left arm pit (What? Really who gets a bump on their arm pit?) I shrugged it off, oh well, it will eventually go away I decided. No complaining over a painful bump. 8:41am After closing my notebook after writing my blog vowing to not complain for the next 24 hours, I grabbed my phone to check the email. My phone had completely froze as in it was not powering on at all. In a panic I began to push buttons to reset it, nothing, it was lifeless. I know it wasn’t dead because I had like a 86% charge when I woke that morning. I kind of chuckled to myself and proceeded to plug it up, of course it came on and I was able to check my email. *I should have recorded this with a picture, but my camera was in the other room and of course taking a picture was the last thing on my mind! I surived the complaints my children made over the lunch I prepared for them. “I didn’t want ham, I wanted turkey.” “Mom, she got more chips then me!” The list of complaints continued. I gritted my teeth, and smiled. After all it was just 12 o’clock, I got this I thought to myself! Piece of cake! Then it happened, you know the realization of knowing you have to take your taking children into PUBLIC and removing your children from the confined walls of their fortress! If your a Mom then you know what I am talking about. Once you escape your safe fortress your children turn into the creatures you can’t quiet recognize in public settings, the Nice Mommy face comes on and they know they are about to get away with murder!!! 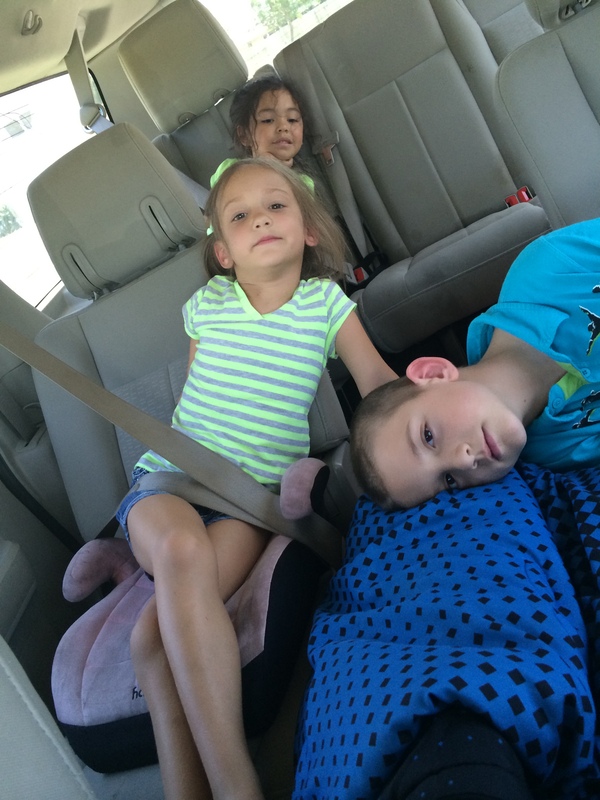 Yes I was about to attempt the unthinkable………….Doctor appointment with four KIDS! Dear Step Son had to get his Physical for the upcoming football season so we got to wait on him for about 45 minuets. Incase you are wondering when we left this building it was around 2:15pm. I got to literally listen to my 7 year old Son complain for the whole duration of the wait. “Mom, I am so bored. There is nothing to do here!” I am not exatruting when I say, this rant was repeated over, and over, and over again. The anxiety was about to start setting in. 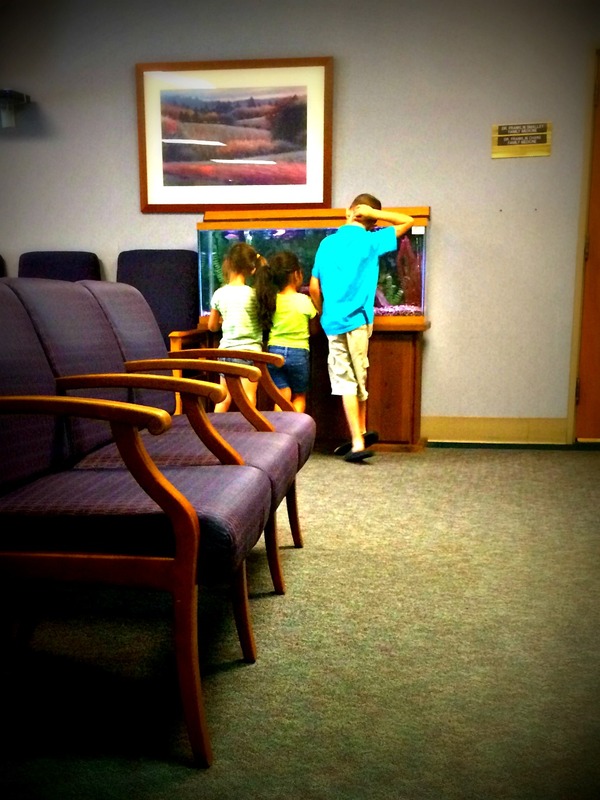 Could I sit here and watch them make the waiting room into their own personal circus ring? I mean a few fish in a tank can only occupy these crazies for so long! LOL Crazies because that is what they turn into when you take them to a waiting room! Although I am very proud of myself. I feel like I kept my composure and with the exception of my 7 year old, no one was embarrassed. We survived and no Mommy complaints. ZIIIING! 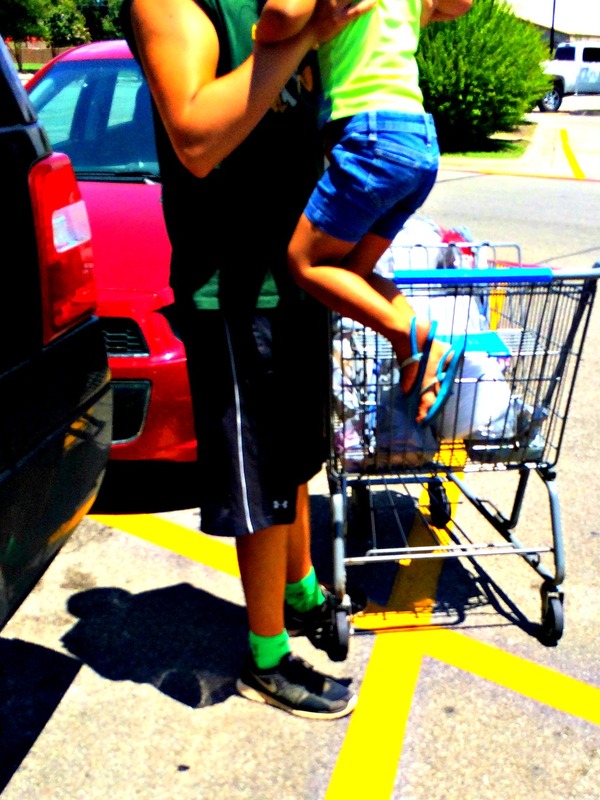 I believe this shopping experience lasted about 45 minuets. I did however have the lovely opportunity to have my dear Step Son step on my flip flop, causing me to almost face plant right smack on the floor, however I am thankful to add that there was no planting of my face that day. One flip flop went flying out infront of me, and my other foot got a boo boo where the flip flop thong rubs against your big two and that toe beside it, right in front of two Ladies having a conversation in the middle isle of Wal-Mart. Mean while I can hear something of the sounds of Dear Step Son yelling “OH flat tire, and Sorry!” Needless to say I was embarrassed as I hurried to grab my shoe and place it back on my foot, so I could go hide in a hole somewhere. I Didn’t react to it, I was just ready to be checked out and headed home. When I took my first step and it stuck for a slight three seconds longer to the pavement, I knew I had felt that heavy sensation before. I had stepped in bubble gum. As you can notice from the image above, I didn’t just step in gum! 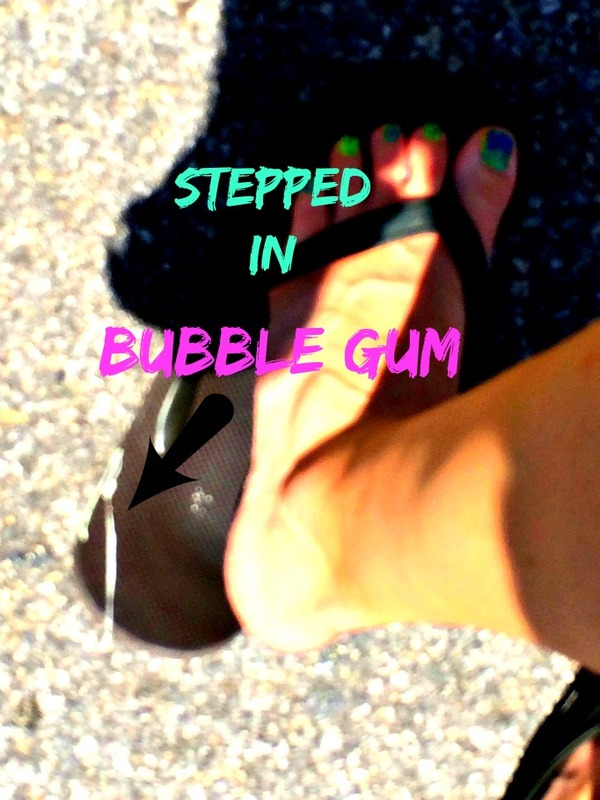 No, this gum was apparently alive and decided to JUMP on my flip flop. It was a sticky mess. Immediately I just laughed. Not a little chuckle or a giggle, no this was like a Panic Laugh. I think I really wanted to cry but all I knew to do was laugh! Laugh hard, loud, rambunctiously. It had quickly become a very stressful day, but I REFUSED to give up on my challenge! I scrapped my shoe across the parking lot, hopped in my car, and drove home. Here are my kids leaving the store, as you can see after the doctors appointment and grocery shopping trip they were as worn out as Momma was! 3 O’clock was our present living time. 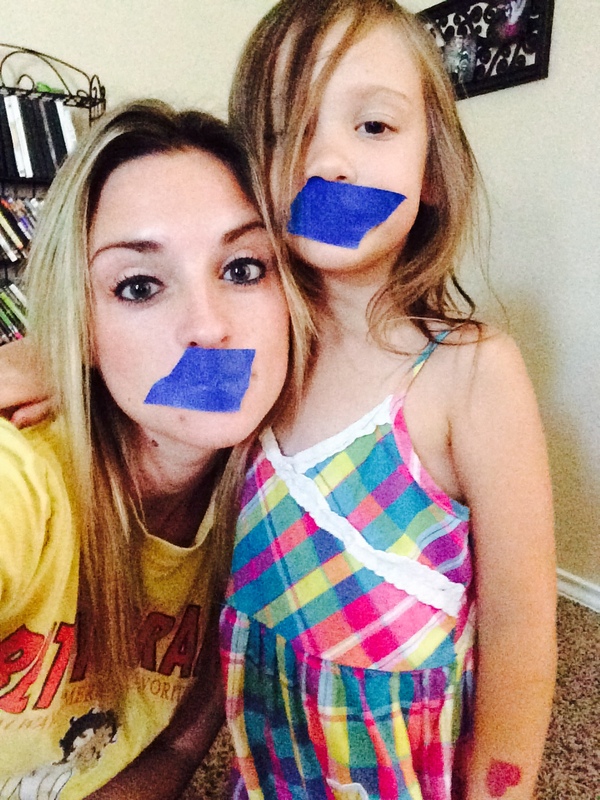 I gave a 60 minuet warning to my girls to finish cleaning the upstairs. Mind you this was a task that they had been working on all morning and still was not even half way complete! 4O’Clock Yea my Husband is home from a hard days work. This is where I needed to pull out the tape to tape my mouth shut because there is just something wired in a woman to want to spew every hardship she encountered that day with the children while Daddy was away. I smiled, grinned, kissed, and hugged him, keeping my lips super glued. This took a lot out of me, but it was do able! How she even got cat poop on her leg is way beyond my reasoning at this point. I knew I had just complained out loud! I will blog tomorrow about my reflection of this challenge. I have learned so much and I most certainly recommend everyone to take this challenge. If you took this challenge with me and were successful I want to know! If you weren’t successful I want to know too! Did you learn anything more about yourself or others? Don’t forget to stay in touch! Like me on Facebook http://www.facebook.com/leighleighspeaks Tweet me http://www.twitter.com/ash_leighharris or sign up for email updates on new posts here! ← Can you handle this 24 hr challenge?